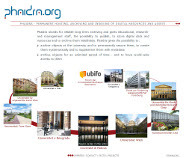 ... the comprehensive university Digital Asset Management System with long-term archiving functions. Ursula Gschlacht (01/ 711 33 - 2263) is available to provide you with detailed information and is also reachable by email at ursula.gschlacht@uni-ak.ac.at. is not only implemented at several local institutions, but is in use internationally, including universities in Serbia, Montenegro and Italy.